Calculations at a general pyramid. 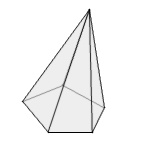 This has an arbitrary polygon as base. If the apex is vertically above the center of the base it is a right pyramid, otherwise it is oblique. Enter two values and choose the number of decimal places. Then click Calculate. This formula also applies to general cones.